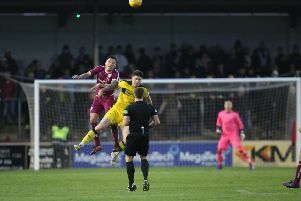 There was finally a return to competitive football for Thistle after a combination of postponements and the festive break had seen them go seven weeks without a competitive game. With Colin Murray on holiday it was Gary Kirk who took the helm but he was without the influential Kirby through illness although the squad was bolstered by the return from injury of Carson. Midway through the first half the deadlock was broken and it was the home side who took the lead with a couple of former Thistle players combining after a poor pass from Ovenstone was well read by Smith who intercepted before sending a pinpoint pass through to Barnes who showed good composure to slot past Anderson. The hosts doubled their advantage 10 minutes from the break when a long ball up the park was latched onto by Barnes who although his initial attempt was well saved by Anderson he made no mistake with the rebound. With the wind now in their backs it was Thistle who looked the more threatening in the early stages of the second half and Ireland should have perhaps done better as Thistle’s woes in front of goal continued. With just four minutes remaining Thistle found the back of the net when Copland held the ball up before picking out Allan and the striker showed great vision to open up the defence with a perfectly weighted ball to Ireland who finished well. Thistle threw everything at St Monans but couldn’t pull level. Commercial Arms man of the match – Kris Ireland. Thistle – Anderson, Ovenstone (M. Hallam 82), Ross (McLean 76), Carson, C. Thaw (Walker 55), Cameron, McGlashan (Copland 65), Gough, Ireland, R. Simpson, Allan. Sub not used – S.Kirk. On Saturday Thistle have a must win match in their battle against relegation when the face Methilhill Strollers with a 2pm kick off at Balmullo.